Although censorship may seem like a thing of the past, current controversies over books, movies, and Web sites prove it to be a very timely and critical issue. 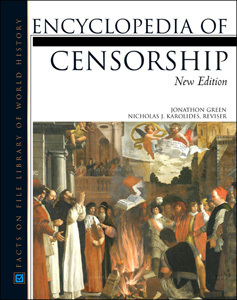 Encyclopedia of Censorship, New Edition presents a full range of information about the history and evolution of censorship and its role in society. Covering all forms of expression—from the office of the censor in ancient Rome to the Internet in the computer age—this reference examines every facet of this complex subject. With an easy-to-use A-to-Z format perfect for high school and college students as well as anyone with an interest in censorship and its politics, Encyclopedia of Censorship, New Edition features entries on Adventures of Huckleberry Finn, Judy Blume, Christian Coalition, the Harry Potter series, Stephen King, and more. "...more than 50 percent new material has been added to provide the latest details on censorship issues from ancient times to the modern computer age. An A-Z format lends to student research, while many an adult will find its references to politics and social issues essential to understanding the latest contemporary arguments." "The articles are brief, clear, and useful for introductory information...this volume is an excellent resource." "...a welcome addition to any library wanting a resource on past and present censorship throughout the world. Recommended." "This easy-to-read source is an excellent addition to the library's reference section as well as a helpful source for high school and college students..."
"The strengths of this resource are its relevance and its breadth of international and national data...Excellent research and timely subject matter..."
"...a serious resource appropriate for a general readership (high school level and above)...This edition substantially updates and expands the first..."